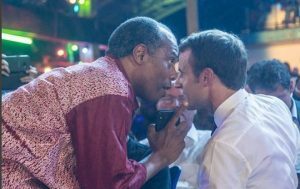 Afrobeat singer, Femi Kuti, has shared the details of his discussions with French President Emmanuel Macron, who had enjoyed a night of music at the New Afrika Shrine on Tuesday. He also claimed that Macron knew exactly what to expect while the night lasted. On his Instagram page, the son of late Afrobeat originator, Fela Anikulapo, had shared some photos from Macron’s visit, captioning one of them, “The discussions I had with President Macron were short but straight to the point about the migrant crises and how to solve them. The post generated quite a reaction from his followers, some of whom commented. One of the respondents, Babajide @sbab97845, asked him, outright, if he told the French President that the roads leading to the shrine were fixed prior to his (Macron’s) visit, hinting that popular singer, Davido, had shared the details on his Snapchat. For emphasis, he added, “You think he doesn’t know our problems? Now you think I don’t know our history and the atrocities France/Europe/USA have committed on our continent? You think he doesn’t have good reason to choose the Shrine over other places to go? “He said he came when he was 23 years old and he used to work in Abuja; he’d come to Lagos to watch me perform, he loved it, he was inspired, he ran for the presidency, he won, had the opportunity to come back.